Journey around quake-hit Nepal Jump to media player One month after the devastating 7.8 magnitude earthquake that hit Nepal, the United Nations has said the world needs to provide more food aid and shelter for those left homeless. Nepal earthquake: One month on Jump to media player One month on Nepal is struggling to cope with the aftermath of the earthquake that left more than 8000 people dead and hundreds of thousands homeless. Nepal boy: 'Mum was buried by rubble' Jump to media player Two brothers, Ganesh and Santos Bharati, whose mother died in the first of two earthquakes to hit Nepal, describe their lives one month on. Shock-proof homes of dirt and sand Jump to media player Architect Nripal Adhikary is building low-cost, earthquake-resilient homes in Nepal using local materials, including dirt, sand and bamboo. 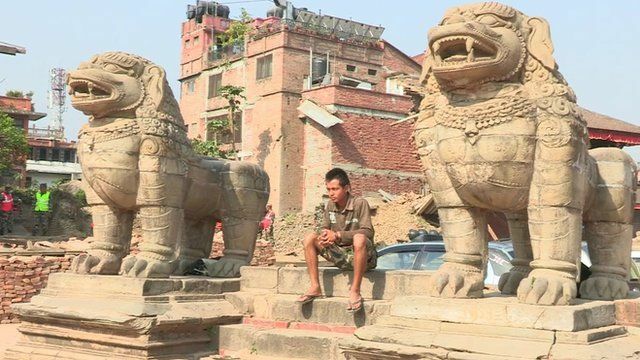 Nepal's quake-hit villages Jump to media player Yalda Hakim reports for Newsnight on the plight of survivors of the Nepal earthquakes. Hollywood actress in Nepal aid plea Jump to media player Hollywood actress Michelle Yeoh, who was caught up in the first earthquake in Nepal three weeks ago, has called for the international community to help those who are suffering. Pregnant woman who survived the quake Jump to media player Few stories from the Nepal earthquake are more dramatic than that of a pregnant young woman trapped in the ruins of her house. Anu Anand has spent the last week visiting some of the worst affected areas.